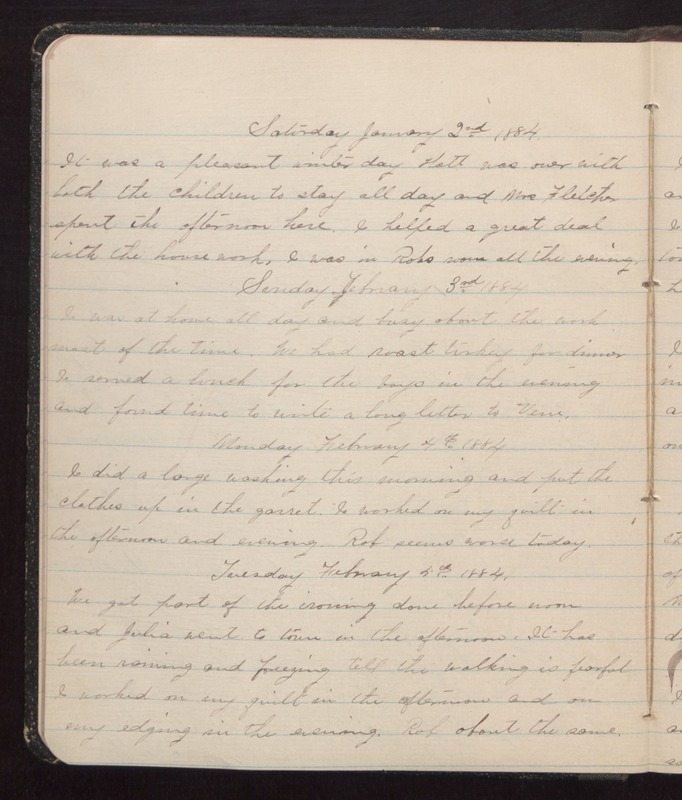 Saturday January 2nd 1884 It was a pleasant winter day. Hatt was over with both the children to stay all day and Mrs Fletcher spent the afternoon here. I helped a great deal with the housework, I was in Robs room all the evening. Sunday February 3rd 1884 I was at home all day and busy about the work most of the time. We had roast turkey for dinner. I served a lunch for the boys in the evening and found time to write a longe letter to Vene. Monday February 4th 1884 I did a large washing this morning and put the clothes up in the garret. I worked on my quilt in the afternoon and evening. Rob seemed worse today. Tuesday February 4th 1884 We got part of the ironing done before noon and Julia went to town in the afternoon. It has been raining and freezing till the walking is fearful. I worked on my quilt in the afternoon and on my edging in the evening. Rob about the same.